Trump says time has come for voter ID because if "you want to buy groceries you need a picture on a card"
President Trump stumped for GOP congressman and gubernatorial candidate Ron DeSantis in Florida Tuesday night in a "Make America Great Again" rally that touched on most of the president's favorite topics. 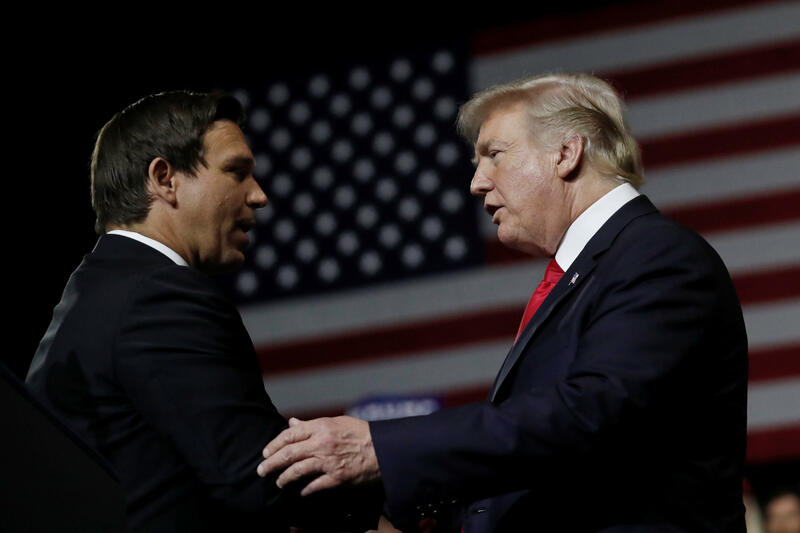 DeSantis has been a vocal advocate of Mr. Trump and his policies, as well as a vocal critic of the Justice Department and intelligence agencies. Florida's primary is Aug. 28. When Mr. Trump arrived on stage shortly aft 7 p.m., he was met by fans with "Make America Great Again" and "Make Farmers Great Again" hats. Supporters also held signs, including one that said, "Hillary Will Start World War 3." In his first two sentences, Mr. Trump mentioned his 2016 victory in Florida. Introducing DeSantis and inviting him on stage, Mr. Trump called him a "tough, brilliant cookie." Mr. Trump also talked up Republican Gov. Rick Scott, who is running for Senate — or more like, he bashed Democratic Sen. Bill Nelson, who, in Mr. Trump's words, is controlled by Senate Minority Leader Chuck Schumer and House Minority Leader Nancy Pelosi. Scott, who did attend an earlier workforce development event nearby with the president, did not attend the rally. As Trump heads to Florida, how are voters there feeling about him? Mr. Trump touched on most of his favorite topics Tuesday night, everything from unemployment figures for African Americans and women, to trade and tariffs. "Now thanks to our tariffs, our steelworkers are back on the job, American steel mills are back open for business, we are starting to set new records, and nobody believed it could happen this quickly," the president said. In one bizarre moment discussing the need for voter ID to prevent voter fraud, the president said anyone who buys groceries needs an ID. That, as anyone who has purchased their own groceries knows, is inaccurate. "You know if you go out and you want to buy groceries you need a picture on a card. You need ID," Mr. Trump said. "You go out and you want to buy anything, you need ID and you need your picture. In this country, the only time you don't need it in many cases is when you want to vote for a president, when you want to vote for a senator, when you want to vote for a governor or a congressman. It's crazy. It's crazy. But we're turning it around." Trump at Florida rally: "Time has come for voter ID"
In another inaccurate statement, the president claimed he is the most popular person in the history of the Republican Party. "They just came out with a poll, did you hear? The most popular person in the history of the Republican Party is Trump. Can you believe this?" Mr. Trump said. "So I said, does that include Honest Abe Lincoln? You know he was pretty good, right?" he added. Mr. Trump tweeted out his support for DeSantis Tuesday morning. "Will be in Tampa tonight. A big year for @RepDeSantis, who will be a great governor for Florida. Strong on Crime, Borders and our 2nd Amendment. Big help on Tax & Regulation Cuts. Loves our Military & our Vets. Has my Full & Total Endorsement!" the president tweeted Tuesday morning. DeSantis, a conservative member of the House Freedom Caucus, has been one of the president's most ardent supporters, perhaps particularly as the president rails against the DOJ and intelligence community over special counsel Robert Mueller's investigation into Russian election meddling and any ties to the Trump campaign. Last summer, DeSantis introduced a measure to end the Mueller probe after six months, although that measure didn't go anywhere. This week, DeSantis released an ad in which he tells his young daughter, using children's blocks, to build a wall, reminiscent of Mr. Trump's desire to build a wall along the southern border. Mr. Trump has threatened to shut down the federal government this fall if he doesn't get the funding he wants for his border wall.